Holger Groh, born on July 27, 1976 in Weiz, received his first violin instruction at the age of six from Franz Diethard at the Conservatory in Graz. In 1991 he continued his study with Alfred Staar in Oberschützen, changing instructors in 1998 to Rainer Küchl at the Vienna College of Music, and beginning in 1999 studied with Tibor Varga in Graz. 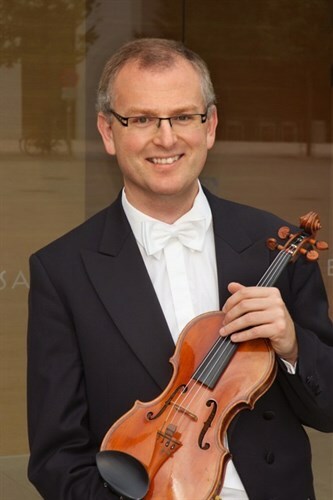 Between 2000 and 2006 he served as first concertmaster of the Graz Symphony Orchestra, as well as being the assistant and personal advisor for their main conductor, Fabio Luisi. Between 2004 and 2008 he functioned as the artistic director of the Styrian Society of Fiends of Music. On February 15, 2006, along with Shkëlzen Doli and Dominik Hellsberg, he performed a successful audition for the second violin section of the Vienna State Opera Orchestra, at which time all three vacant positions in that section were filled. Holger Groh can already claim a successful career as a chamber musician. He is the first violinist of the "Vienna Piano Quintet", concertmaster of "Vienna Trumpet and Strings", as well as being a member of the "Vienna Virtuosen" and the "Steude Quartet". For the ORF, the Polish Radio and the Japanese CD-Label CAMERATA, he recorded the 2nd String Quartet by Nancy van de Vate (World Premiere), works of Wolfgang Amadeus Mozart as well as the Concerto for Two Violins in D minor, BWV 1043, by Johann Sebastian Bach, with Dmitry Sitkovetsky as his partner. As a soloist he has performed with numerous orchestras, including the "Vienna Bach Solists" and the Graz Symphony, appearing with such conductors as Milan Horvat, Arturo Tamayo, and Karel Mark Chichon, among others.